Across all DGM projects, over 150 leaders from indigenous peoples and local communities ensure the DGM’s successful implementation by serving on its 12 steering committees. In total, they are leading and overseeing the implementation of a portfolio of over US$ 50 million in climate finance from the Forest Investment Program. Beyond providing direction and oversight for these projects, the steering committee members help the DGM remain transparent and inclusive by representing the DGM in communities and serving as a point of contact between community members and the program. In a 2018 survey of participants in exchanges hosted by DGM Global, over 80% of respondents reported that they viewed the DGM as both transparent and inclusive. 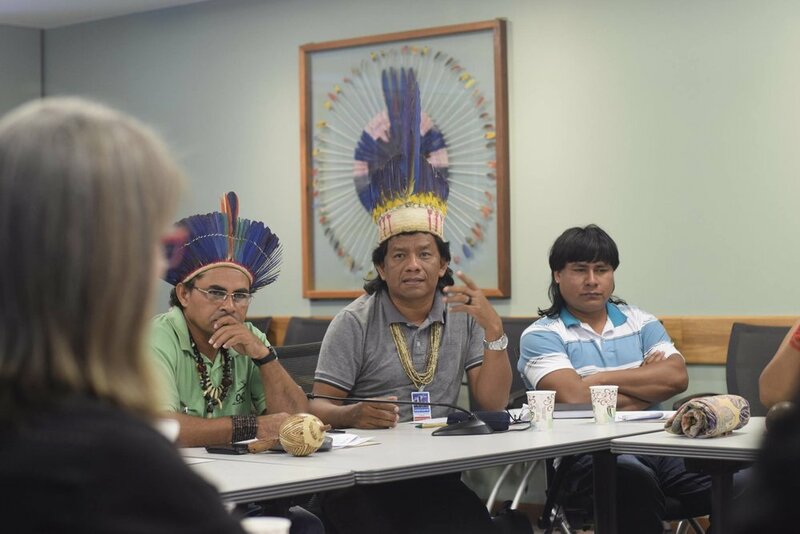 With DGM support, indigenous peoples and local communities come together to share their knowledge and learn about essential topics for engaging in climate action and sustainable forest management within their countries and internationally. This is the central focus of the DGM’s Global Learning and Knowledge Exchange Project, which holds annual regional exchanges in Africa, Asia, and the Americas, as well as a Global Exchange held just before the annual Conference of the Parties of the United Nations Framework Convention on Climate Change. Each of these exchanges is tailored to fit the needs of the participants and the experiences of communities in each host country. As of January 2019, DGM Global has brought together over 200 leaders from indigenous peoples and local communities from 37 countries. By engaging with other members of indigenous peoples and local communities from around the world, participants benefit from the cumulative knowledge of the group and can better represent the needs of these communities at an international scale. Indigenous peoples and local communities can also enhance their engagement in climate action through greater engagement with relevant networks and organizations and by understanding the resources available to them through these connections. The exchanges hosted by DGM Global have featured representatives from over 100 networks and organizations supporting the engagement of indigenous peoples and local communities in sustainable forest management and other relevant issues. 95% of respondents to a 2018 survey of exchange participants indicated that their engagement with these organizations had increased since participating in a DGM exchange, with 83% reporting increased frequency of engagement, 85% reporting more effective engagement, and 93% reporting a higher level of responsibility. While the DGM has many accomplishments to celebrate, the potential for programs like the DGM is much greater than the scope of this pilot program. As such, a key component of the program is elevating its successes to an international scale to encourage continued and expanded support for direct access to climate finance for indigenous peoples and local communities. The DGM supports this goal by bringing its leaders and partners to major national and international events to share their communities’ experiences and successes with the DGM and with sustainable forest management more broadly. By sharing their stories with governments and other stakeholders engaged in climate policy, they will continue to gain credibility as key partners in global efforts to address climate change.